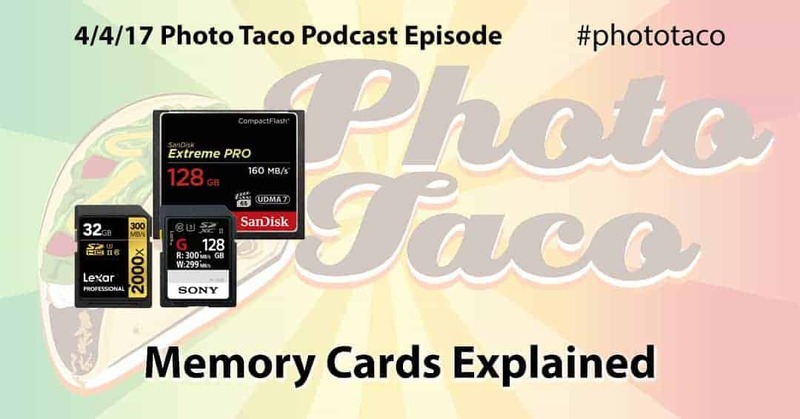 Photo Taco – Memory Cards Explained! 3. How fast are the new Sony SF-G series UHS II cards? Are they the fastest in the world as Sony claims? 4. What camera manufacturers are using the fastest card slots or best taking advantage of card speeds? 5. Any card brands that are better than others? Are SanDisk and Lexar at the top like Improve Photography has been recommending? 6. Any brands of memory cards that photographers should stay away from? 7. How do photographers stay away from fake cards when they buy them online? 8. There are so many symbols and numbers on the cards, what should photographers look for? 9. Any signs a photographer should look for to know that their card is dying? 10. What are the top 3 to 5 things photographers should do to take care of their cards? Get $10 off MacPhun Luminar by using coupon code PHOTOTACO at checkout! 1. Will security scans / x-rays damage cards? 2. How long can data stay on cards without them being powered? 3. Does mixing different cards with different speeds help if you write Raw to faster card and JPEG to slower? 4. Is it faster to offload photos using a card reader or a cable? 5. Does it hurt cards to delete photos using your camera? The hobbyist editor here at improvephotography.com. IT Professional by day, passionate hobbyist photographer ever other second possible. Living in Herriman, Utah. Loves trying to capture the beauty around every day and family portraits occasionally. Be sure to check out my portfolio at http://jsharmonphotos.com.